Alternative and Augmentative Communication (AAC) is any form of communication that people use if they are unable or unwilling to use standard forms of communication such as speech. 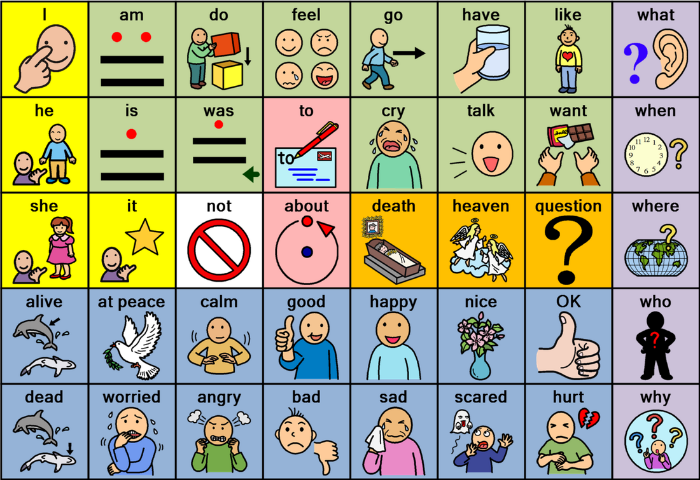 Unaided AAC includes those forms of communication that we all use alongside spoken language and which do not require an external tool. Aided AAC systems use an external tool or device, electronic or otherwise. Aided AAC systems are sometimes split into low and high tech systems. Low tech describes alternative and augmentative communication strategies which involve the use of equipment that is not electronic. Low tech communication aids are often paper based and include communication books, charts etc..
Communication Boards and Boards A board or book which shows words, photos and/or symbols. Picture Exchange Communication System (PECS) form of alternative and augmentative communication in which a child is taught to communicate with an adult by giving them a card with a picture on it. High tech describes all electronic communication aids from single message switches to sophisticated, computer based communication systems that have many additional features. Mobile Devices. A range of portable devices such as mobile (cell) phones and tablets. Voice Output Communication Aids Devices, also known as VOCAs or Speech Generating Devices, which enable the user to speak.